A.k.a. the great cheese move of 2015. TL:DR; we are looking to change the navigation of the question lists on the site. We are not looking to remove any functionality or break any existing link. This is not final. We’re taking a very iterative approach and need you to help us. There are around 20 different question lists on the site. They are grouped together on pages based on vague similarity, but the navigation is fairly flat. We want to add new features and the current UI is not tenable anymore. Adding “even moar awesome” will make it even more confusing! We have a working design and we will implement it, but it will be visible only to a few thousand volunteers. This is opt-in via a new “alpha channel” option (and people can opt-out any time they want). After the initial implementation we will iterate the design with the volunteers. As soon as we think we can share this to the wider community we will enable it for all (probably on meta.se first as usual). We have a clickable mock up prototype here! We will remove the “Unanswered” button and make the home page part of “Questions”. They will all go to the same, unique page anyways. A: Because they largely correspond to the three main use cases of question lists: finding questions to answer, read or moderate. We want to make it easy for inexperienced users to find the right place to either read, answer or moderate. Q: Why merge home & questions? A: Because the simplest, expected behavior for a section called “Questions” is that it contains ...questions. The home page contains only lists of questions, so it belongs there. Q: Why get rid of unanswered? A: Because of multiple reasons. It doesn't make logical sense with the other top navs: The “Questions” section contains questions, “Tags” contains tags, “Users” contains users and …”Unanswered” contains questions again? We have ideas of other top navs to add in that menu quite soon. This creates some much needed space for them. Q: What happened to excerpts and why? A: Excerpts are still there. To turn them on and off you can use the gear menu or click on any link that currently sends you to a page with excerpts. We reserve to expand that menu with more features (just not in this first iteration!). Q: Where is <insert favorite tab here> gone? A: All currently available tabs are mapped to a combination of tab and sub menu elements in the new UI. Nothing is lost. We counted the clicks and most combinations are reachable with the same number of actions as today. In fact, the new tab combinations will be a superset of the current question lists. Q: What happened to the "All Newest Questions" tab? A: Nothing. Currently to reach it you click "Questions" and then choose the "Newest tab", unless that was your last choice, which we remember. In the future, you will click "Questions" and then choose the "Newest sort", unless that would have been your last choice, which we will have remembered. Q: What is the "Show Recommended" sub menu? 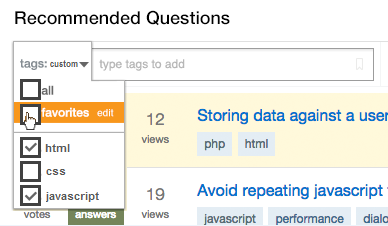 A: it's the same as the current "Interesting" tab on Stack Overflow. It will only exist on Stack Overflow. All the other sites will not have that "show" sub menu in that tab. Are we improving something you care about? Is this iterative approach something you’d be interested in experimenting with us? Are there any major flaws in our “iteration one” plan? We will soon open sign ups for the "alpha channel". Stay tuned. The [+] sign doesn't really tell that this is for bountied questions. It looks like I can add a new tab by clicking on it (like in my top bar). I'd suggest to display a number of bountied questions in this blue frame instead of just a plus. I really like the idea of "stuff to read", "stuff to moderate" and "stuff to answer" tabs, but the tab names in the mockup don't seem to match that. "Needs Answer" is obvious, but I don't see the connection for "Recommended" and "Popular". Edit: After thinking for a minute, my first thought for alternative names would be "Current Activity", "Worth Reading" and "Needs Answering". Definitely not the perfect names, but hopefully it helps. My cheese has been moved and I have a few comments about it. I think these three areas are most important to how I decide what I'm going to answer/read during this session on Stack Overflow. Where are my favorite tags? The favorite tags under the community bulletin is how I quickly get to the tags I care about. One click, from any question page, and I have a filtered list of questions I'm interested in reading/answering. If I want to be even more specific, I'm then presented with a list of related tags that I can additionally filter by. With the new layout, there is at least one extra step - I have to type in the tag (or tags) I'm interested in. "But you can use the Tags -> Favorites option, Andy!" True. If I wanted to see ALL of my favorite tags at a time. I usually don't. I focus on one or two tags that I'm most interested in most of the time. They are favorites because I know the technology and could probably answer a few questions in those tags, but I'm not interested in spending my time wading through the questions as often as I do in certain, specific, tags. Feature Request: Have a way to directly navigate to favorite tags. This is currently fulfilled via the list of favorites that appear under the community bulletin. This blue plus, at best, provides me no information. However, I'd argue that it is completely counter intuitive. A plus sign, next to tabs, means "Add a tab". All of my browsers have trained me over the years to understand this. If I want a new tab, I click that plus sign. The featured tab, as it currently exists, provides at a nice quick glance if there are new questions on this tab. I don't know what the exact number of featured items was last time I visited, but I have a rough idea if it has gone up or down. If it's gone up dramatically, I'll click through it and see if I can answer any of the newer questions. A blue plus hides these questions. They are no longer featured. The bounty that someone has spent their precious reputation on is being wasted. There is nothing drawing me to these featured questions. The blue number on the current tab does that now. A plus sign doesn't draw my attention. Instead, it sits there waiting for me to need a new tab. A minor UI gripe with this: When you click the tab, the active highlighted tab becomes "Needs Answer". When you click "Needs Answer", the list of questions change. Feature Request: Expand the plus sign to be a full tab. It is already serving that purpose, it has just been compress to an icon, instead of a tab with a text label. Give it the label that it already has. It will also reduce the confusion level of what a "+" actually means. It's been mentioned in comments and other answers, but I think it's important to have a way to see unfiltered questions without multiple button clicks in various areas of the UI. It's also confusing how this must be accomplished in the "recommended" tab. New, unfiltered, questions aren't my idea of a recommendation. Feature Request: I think this can be solved by a name change of the "recommended" tab and a way to short cut to certain areas. To get these new questions requires that I a.) Click "Recommended" b.) Click "Show: All" c.) Click "Sort: newest" vs the current a.) Click "Questions". Q: Are we improving something you care about? I would really (really) love a search box to be more prominent than the tiny box in the upper right. My completely unfounded and likely wrong gut feeling says that if you make it more obvious that the site is searchable then the tide of poor quality or duplicate questions (on StackOverflow, at least) should recede. Are some of tabs duplicating another ones? For example: what is the difference between "recommended" > "all" > "votes" and "hot" > "all time" > "votes"? They would both show all the questions sorted by votes, right? And, by the way, in the "recommended" tab I supposed to see the recommended questions (whatever algorithm used to show it :D). But even in "recommended" tab I can choose "recommended" or "all" sub tab. Will they function differently? Are the "recommended recommended" questions are just recommended and "recommended all" are all the questions? Then in the second option, all the questions won't be just recommended, but it would show the full question lists, right? But if in the second case it shows all the recommended questions, I can't see the difference between those two options. "Unanswered" needed to be called "Undecided" this whole time; there's answers there, just none chosen. "Unanswered" (the new one) should show questions that have NO ANSWERS. I can only fathom that dis-allowing this type of search is to prevent users from answering questions that don't deserve one, and preventing FGitW answers. I rarely use those tabs because they don't do what I want, nor do they do what they literally say. And Re. a post I saw on Workplace Meta about there being so much more white space when you click Questions (as opposed to the default page), that's another reason to ignore those tabs up there. I think it would be great to allow users to add shortcut-tabs. So as I wouldn't have to dig through "recommended">"all">"newest" to get to the newest questions. Also, in the mockup I can't see "favourite tags" in the sidebar. Please leave this feature. It is misleading in the extreme that the way to get the plain unfiltered list of newest questions is to tell the site that I want to see "recommended" questions. When I want to see the newest questions, I explicitly don't want my view of the site to be restricted, filtered or reordered by someone's (who?) "recommendations". What kind of UI wisdom says that the way to get what I want should be to click the link promising the opposite of what I want? Edit: In chat I learned that the only content of the "Recommended" tab on sites other than SO will be lists of all questions by activity and age. Is there any reason not simply to call it "All", if that is what the tab will contain? The "tags" dropdown box has 2 options: all and favorites. What happens when you type some tags and press Enter? Will the box still show tags: all, or would it show tags: followed by the tags you entered? If it shows tags: all that would be confusing since it's only showing the questions for the tags you entered. What kind of widget goes here? How do you connect to a Tartran database? How many widgets fit in a text notice? I don't need to see "votes", "answers", "views", or "tags" for this list. They just clutter it up and a are distracting. If you a viewing a popular list, "views", "votes", and the question title are about all that matter. I would recommend changing the font color/weight of placeholder "type tags to add". It is extremely faint, and I barely noticed it at first. When I first looked at the mockup, my intuition for the + was that it was decoration for the adjacent "needs answer" tab, as in "These questions need an answer; add yours!" Given that you have an explicit option for "bountied questions" as a filter under the "needs answer" tab, it seems that your intent is for this filter to be the primary means to access the bountied questions, and the + is intended to preserve a modicum of front-page exposure for the existence of bountied questions. However, by not making it a tab with an explicit label, it does not intuitively provide such exposure, though it does provide a shortcut to in-the-know users, saving them one click on their way to the bountied questions. I agree with your comment, replying to another answer pointing out problems with the +, that displaying the number of bountied questions on the front page of Stack Overflow, doesn't tell the user much of value. Changes in that number are mostly noise to any particular user, generated by bountied questions that that user is not interested in. However, on smaller sites or after the user has filtered down to a particular tag or tags of interest, the number could become relevant, since each new bountied question may actually be of interest and worth hunting. Therefore, I think it does make sense to continue to include the highlighted number on the filter option, as you have in the mockup. I also agree with Anonymous Penguin's comment on that answer, pointing out that the different bounty reasons should be treated differently. All except "Reward Existing Answer" request more or better answers, so it would make sense for questions with those bounties to be included in the bounty filter under the "needs answer" tab. "Reward Existing Answer," on the other hand, is a signal that there's something there worth reading, not that there's a request for answer help. Therefore, questions that have an open bounty of this type or have recently been awarded one should be in a special filter under the "recommended" tab. Regarding the front page, I think the right thing to do depends on how valuable you want bounties to be. Until now, they enjoyed a prominent link from the front page. If you take that away, relegating their visibility to a filter, then you are devaluing them. Perhaps this is for the best, if people processing bountied questions is not as valuable to the site as a whole as was originally assumed. In that case, I'd suggest just omitting the + and letting people discover the filter when they're looking for stuff to answer under the appropriate tab. If, on the other hand, you want to preserve visibility for bountied questions on the front page, I'd recommend giving them their own tab, called "featured" or "bountied," instead of a confusing half-measure. Here's a problem with the placement of the tag selection box. Home page: there is no box in that position. On the new design, you want to put a box in roughly the same position as the "Type to find tags" box on the Tags page or the "Type to find users" box on the Users page, and make it a box to type tags in so you can filter by them. The function of the box will be different depending on what page the user is on. I understand why you want to filter by tags. Even though I don't do that often, I grok that for extremely busy sites, this is needed. But what happens with the brand-new user? The box to add tags to filter by is now more prominent than the search box in the top nav bar, since it's more central on the page. On sites like Google the user is used to having a search box in the middle of the screen. Some users may expect the main search box to be functionally equivalent to the box in the top right, as it is in their browser (e.g. on Firefox). Complete newbies may expect the tag selection box to be the search box, as in @Tieson T.'s mockup. Why isn't the box to search for questions there? Whereever the tag selection box ends up, as @michaelpri said, the text "type tags to add" is very faint. Should the text say "filter by tags here" or something else, and in darker print, to make it more clear that the tag box isn't the main search box? No, there are four. One of them – the "featured" tab – has a bizarrely counterintuitive label (and highlights the wrong tab when selected), but otherwise each of "recommended", "popular", "needs answer" and "+" all behave exactly like tabs in every other UI anywhere on the web. I understand the rationale here (that bountied questions are a subset of questions which need an answer), but that is not the case. The bounty system is a contract between the bounty-offerer and SO: "I will give up some of my reputation in exchange for increased attention", and there are a range of reasons why someone might make that offer, not all of which have anything to do with the question needing an answer. Bounties cut across the other categories, and given their purpose, they need a navigation element which is more discoverable than the one for those other categories, not less. Fixing this is straightforward: just replace the "+" with the word "featured", and keep the blue lozenge. Personally I don't much care whether the number is also included, but for the sake of discoverability, a clear, descriptive text label is vital. As a side note: the sentiment behind the comment 'that's a case for eventually not showing questions with "awesome" bounties in that list, not a case for making it a tab' is particularly problematic: now you're proposing not only to hide questions people have spent rep to promote behind an inscrutable blue pill, but to not feature them at all? That's just rubbing salt in the wound, and it's a violation of the promise that bounties represent. The gear was kind of confusing. It usually means "settings" but there are a lot of settings visible without it ever being clicked. Since the top area looks a bit cluttered, you could make it the only thing there, and clicking it would expand out the "filter", "show", "sort", and "mode" setting areas. Alternatively, it could start expanded to educate the users, and clicking the button would collapse it. I arrive at the page by clicking Questions. Next I select Popular because I'm interested in that. If I now click Questions again the mock-up selects Recommended again. That is not the sub-tab I selected. If that is the intended behaviour could instead be remembered on which subtab I am/was? If not server-side maybe per session? That behavior of switching back to a default system decided subview is similar to what search does at the moment. It always selects Relevance where I find Votes more interesting. I don't know how the unanswered tab works, but I'd like to see it show up in that tab if there's no upvoted answers. In this case, the tab is a bit misleading. A title of low answers or needs more answers might work, in which case bounties could be scattered into this list, or separated. Fix the add tag box! It adds a lot of clutter to the design and it makes it look like there's two search bars! I would suggest adding a link that says "edit favorite tags" that will pull up a modal or take you to another page that lists your tags, along with a button to add or remove those tags. When I look at top--that is the Questions, Tags, Users, and Unanswered links--I usually think of each link as a subdivision of the site. It might make navigation easier if the Questions link is "active" when on the homepage. Any time you're looking at a question or a list of questions, it should be active. This would simplify the UI because it would essentially be dividing the site into categories, with the most commonly used categories listed at the top. To fulfill this philosophy, you've already started: you're already removing the "unanswered" link at the very top, which I always found that confusing because it makes it seem like unanswered questions aren't questions because the Questions link isn't active. I think it should be because you're looking at a list of questions. Didn't look at the mockup close enough: they added it. On a side note, who gets in on the alpha channel and how can I try it out? Will it only be on SO initially? Convert "popular" to "active," focusing on newly asked, recently active, and "hot" questions. Move "most linked" to be a sort under "recommended," rather than "active." Consider creating either an "all" tab or a "browse" button next to the search box, that gives you a list of all questions with conventional sort and filter options, as if you searched for everything. That way, people who are used to working with a bare-bones list and coming up with their own ways to filter and sort it can have a clear place to go for that, and don't have to guess whether it's buried under "recommended" or "active." This could be a replacement for the "Questions" button, which is potentially confusing to someone already looking at a pile of questions and a bunch of methods for sorting and filtering them. The other buttons up there, "Tags," "Users," "Badges," and "Ask Question," are all primarily for meta-content rather than for browsing the site content, so "Questions" seems out of place up there anyway. At first: really good idea, it is the time to improve this part. But what means "recommended" exactly? Filtering on favorite tags or votes or what else? I would have a provided time filter at "popular" for "today", too. Further it would be great to be able to define some individual queries by myself. Where it's possible to define tags which have to be in- and excluded, also defining the time range. Additionally there's a need for a switch to show only questions with accepted or not accepted answers. It would be a nice feature to specify an max/min amount of votes for an answer/question. I know, implementing such possibilities would require a bunch of new hardware, but could it be possible to provide one individual filter per user? The one I have in mind especially would require only one execution per day to optimize my contribution to the community. I'm not sure if I'm happy with the tag selection box if I can only enter tags there. Can it also support normal search? If not I prefer it to be possible to take your input to the search box and/or start a search to bring you to the search result page. Oohh yes please with the compact view esp. if you are planning to add more white-space. On the Compact view topic, I like the idea of having an Icon represent a tab like Bountied Questions - Not a plus sign because as mentioned we have been trained to think of that as adding something, a question, or a tab, or an answer, or a comment, so don't use it for bounties. For bounties you could use a dollar sign or something that implies reward. However, a single icon like a plus could be used in multiple places around the site wherever we want to add content as long as it's consistent and always means "add something". Once we know where to find things we don't need a title where an Icon will do - Icons might be the answer to the "what are we going to name this tab" dialemma - a picture to describe the intention. yes lets make things less wordy but pictures can help our international guests too! When we have a bunch of tags selected can we have a toggle so that the filter is applied as either "any" (a super-set of questions) or "all" (a very specific sub-set). Also, I know it's minor, but usability is about making the new seem familiar, the tags box should resemble the search box - search icon + default text(search) >> tags icon (on the LEFT) + default text(add tags) - something this simple should also be obvious... no thought required. Why have a few pre-defined filtered tabs and have people like me constantly suggesting how the filter could be made more relevant (...for me!) when you could have one icon that looks like a filter which shows a Multi-Select dropdown with "no answers", "no upvoted answer", "exclude downvoted Q's", "popular Q's(more than X# up-votes) etc, then a little dividing line, then another category of filter. You could even move the tags selection into this filter dropdown as well, with the search box as the first/last item in that category. And similarly yes, an icon for sort with a dropdown for dates/votes/activity or whatever. If you can remember the last tab we had selected, it seems you could also remember what we last had our filter and sort selected as. I would think this would (almost) be set and forget for most users, if you are worried people will be concerned about the number of clicks. I have gone on about Icons but I do realise that text is helpful too esp. for new or infrequent users. but perhaps there COULD be an option to turn that text off eventually... I like a clean/simple/uncluttered UI - but that's me. I dont think "badges" belongs in the upper navigation area at all, just like priviledges wouldn't belong there. Ask question could be a bit more attention grabby... on the odd occasion I have asked a question I have had to look for it. I think it should be treated differently because the others are "show lists of" and "ask question" is "do something" (perhaps a blue plus icon somewhere prominent). I like the site, and the cheese move. The plus icon relays the message "Add a tab" rather than "show bountied questions"
Therefore, I think the best option is to combine these two tabs into one "Unanswered [nrOfBountiedQuestions]". Should the need for a shortcut to the featured section arise, separate them completely and don't show the option to filter bountied on the unanswered tab. I'm not sure if this is exactly what you're looking for, but I desperately wish I could click on TAGS and see all the questions tagged with ANY tag I've Favorited, and no questions that don't have a "favorite" tag. This might not be helpful for new users, but for example on arQAde I tend to favorite every video game tag for games I own, however there are tons of questions about games I don't own, and can't answer... it would be wonderful if I could see new Dwarf Fortress, Smash Bros, Skyrim, etc. questions all in one feed without also seeing League of Legends, WOW, etc. questions. Edit: So there is a way to do this, but it's not simple, and most people who are likely to want to do it wouldn't know to. intags:mine is:question shows all the questions with tags you've favorited, and only the questions. is:question is required to keep from having every questions show up Answers+1 times in the list (eg a Q w/ 2 answers would show up 3 times). Add the search as 1 more selector, not a global thing on top of the site. Remove the "recommended", "popular", "needs answer" tabs. They are largely redundant and could easily be integrated with the "show" combo-box. For instance, the same combo can include "popular", "recommended", "no accepted answers", "zero answers", "pending bounty", etc. You can do this a bigger/prettier combo-box if you like. Overall, the idea would be to put all criteria for filtering and sorting questions together, making it easier to check the status. One interesting alternative: you can change the "popular", "zero answers", etc options to be tags too. Put them in a different color since they are meta-tags, but with a unified mechanism to apply tags as filters. Some of them seem rather exclusive though, but for instance, "not accepted answers" would be include all questions with "zero answers too". I like the idea of improving navigation, but there are some major confusion issues as a lot of people have already mentioned. For my answer, I'm going to focus on the Tags Filter part. What should happen when you add a tag? Would it trump your current tag selection and filter to only those ones? Or would it add it in conjunction with already filtered tags? Hidden bookmark icon on the right of the box, that icon AFAIK, means bookmarking. We are not bookmarking anything here. Or are we? "type tags to add", add to what? It would make more sense to me with something like "add tags to filter by"
So we only get all, or favourites? Not a whole lot of choice here. In one of the other answers, you mentioned a potential feature in v2 for adding custom tag lists, I believe this would create a ton of useless list clutter, as more often than not, filtering for custom tags (non-favourites) is like a one time thing. I just want to find questions with those certain tags at that specific moment. I don't care about actually saving the list. Another issue is the favourite option. Yes I would love to filter by all my favourites, but what if I only want to filter but a specific subset of my favourite tags? There is nothing in the current design that lets you do that aside from re-adding the ones I want one by one from the box. Instead of a normal dropdown, I propose a checkbox dropdown. The dropdown would include All/Favourites/List of individual favourites. (Individual Favs) - clears All and Favourite options, allows user to individually check subsets of their favorite. Maybe there are scenarios that this dropdown might not work well, but overall I think it would be a lot more helpful. I have a medium size list of favourites and not all the favourites relate to each other. At the moment I may just want my web-development-favourites, and this sort of dropdown allows me to filter as precisely and as broad as needed. See my basic mockups below. My main problem is that I don't get the answers I am looking for via search but if I use Google with similar search queries I generally find what I am looking for (still on stackoverflow). The blue 'plus' sign is not intuitive that it's the bounty list, especially next to drop down menus (yuck, I sure hope the expanded view does away with ALL of them). Sort by could be a drop down menu I guess, but it shouldn't change when you switch tabs. Needs help would be every question on hold, late answers, stuff waiting in review queues or flagged for moderation, ect. I like this flow as it starts with everything and ends with stuff you'll never need unless you moderate. Most people will find what they want in the middle 4 tags. Ask a Question should be on it's own somewhere; a stylized button. Asking a question should be taken as an event not to be trifled with. Parts of my other answer and Tieson T's all taken together (if not others here as well), would make for some good steps towards enabling the community to better take care of itself: getting the foot soldiers involved in helping clean up and reduce the noise they add in the first place. How about making the questions tab unclickable when already on it? Seems intuitive to me. Not the answer you're looking for? Browse other questions tagged discussion design navigation homepage new-nav . Would it be good if we combine all these [home, questions, unanswered] question page? 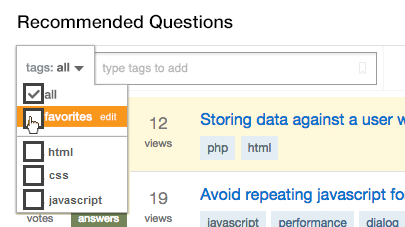 How can we increase visibility of bountied questions with the new navigation? Should the navigation tabs be less sticky?